The Charlotte is a 1,573 sq. 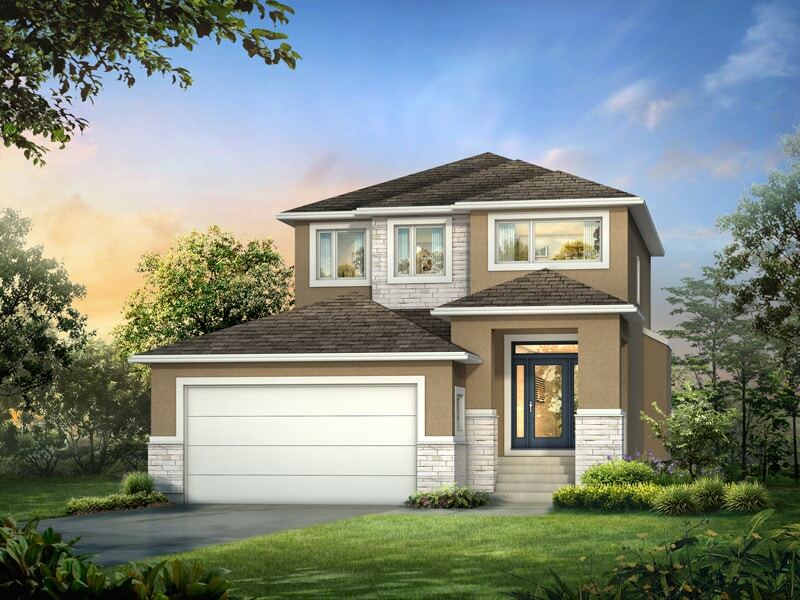 ft. 2-storey, 3-bedroom, 2 1/2 bath home with 9′ ceilings. The open-concept great room with its contemporary gas fireplace, millwork floating shelves and tiled accents is perfect for entertaining. The kitchen boasts an enlarged island with extended bar, quartz finishes, walk-in pantry, custom maple cabinetry and ceramic tile backsplash with plenty of counter space. Laminate and tiled floors shine throughout the home, accented by the numerous pot lights and spindled staircase. The master bedroom features a deluxe ensuite with a custom tiled glass shower, stand-alone tub, a double vanity and a large walk-in closet. The exterior stone veneer and stained wood trim detail, combined with an abundance of large windows and deck, make this house stand apart from the rest. Log in or sign up to instantly see The Charlotte. Square Footage: 1,573 sq. ft.